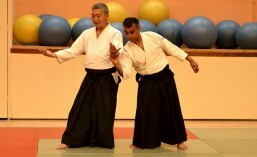 The best way to see whether Aikido is for you is to try a few classes. Aikido is a Japanese martial art with an array of etiquette which might seems alien to you at first. Further, it is common for onlookers to think that Aikido techniques are fake and complicent as they are performed so gracefully. Actually, the history of Aikido is peppered with stories of young men, already experienced in their own martial art, attempting to prove the Aikido practioner was a fraud, and failing. Aikido is a physical art and needs to be experienced with your body which will needs to be conditioned to receive a technique. This takes time. As with any discipline, you will need to make some commitment, with an empty cup, to see whether it is suitable for you. Aikido cannot be learnt solely from a book or from watching clips from Youtube. Whilsts useful, you will need a qualified teacher who can watch and guide you through the nuances of the art. Regardless of style, the choice of teacher is paramount, as this gives an insight into how you and your Aikido journey will develop.